Hi my question is our new van has a 12 pin plug the van has the usual fridge etc but it also has a battery..van is a jayco flamingo 2014 should we keep the 12 pin plug or change it ? Hi Chris, we would recommend would keeping the 12 pin but bypass the battery charge feed from the 12 pin and run the charge feed through an Anderson Plug instead. This will allow more current pass through and stop any melting of the 12 pin pins. Hi Briohny, 2 years ago an auto electricain wired my 80 series LC for electric brakes(Primus IQ), as we had bought a Jurgens dual axle caravan. The connector now needs replacing and on taking the cars connector to bits I find that the wires do not match the Narva connectors, I have bought. A 5mm Red & Black wire has been added! The car connector has 1=Y,2=5mm Red, 3=W, 4=G, 5=5mm Black,6=R,7=Brwn.So I replaced them one for one with the new connector.I noticed the blue wire was not used. My worry is that the caravans connector has the Blue wire on pin 5? However the pin 5 is occupied by the 5mm Black, on the car connector? I looked under the dash and the wiring to the Primus IQ has been connected up using two 5mm Red and Black cables, as follows. Primus Black (battery 12+) connected to two 5mm Reds, Primus White ground (battery negative)connected to one 5mm Black, Primus Blue (brake) connected to one 5mm Black. The Primus Red is connected to the cold side of the foot brake (G/W). Your advice would be appreciated, as I do not want to burn anything out. Johno. Hi John, everything sounds like it is in order. If you are concerned at all, we always recommended taking your vehicle to an Auto Electrician. This is the kind of thing we do all day every day so for peace of mind when you’re on the road, it’s usually the best option. I have a 7 pin round metal plug on my tow vehicle and caravan. I charge my caravan fridge from the car battery through one of the pins while I’m driving. (I unplug the connectors when we pull up). I have no Anderson plug. I am going to get a battery installed in my caravan. Can the car battery charge the caravan battery through one of the pins while I’m driving or do I need to install an Anderson plug for this purpose? Meaning extra cabling will need to be installed through the caravan to the caravan draw-bar and cabling from the car battery through the car to the back of the car? Can you tell me if the blue wire on pin 5 of the factory fitted trailer 12 pin connector on my Ford Ranger can be removed completely. At the moment on pin 5 there is the original blue wire and a blue wire from my brake controller. I need to loop pin 5 brake controller wire around to pin 11 for my new caravan, but the pin hole is too small for three wires. I own a Ford XLT Ranger and have a brake controller with its blue wire connected directly to pin 5 of the trailer socket.There is another blue wire connected to this same position, Ford call Services Brake. Can I remove this wire as I need to loop the brake controller wire around to pin11. My new caravan requires pin 5 and 11 for this input. Yes, remove the factory wire in pin 5 and fit a wire direct from the brake controller. What voltage should I be getting at my tow vehicles anderson plug when the engine is running. Hi Kevin, it depends on the vehicle you have, the size and style of the alternator on the tow vehicle will mean different voltages. Just bought an old caravan with Britax 12 pin plug. Doesn’t fit car 7 pin fitting. Can’t find a connector to suit in any of the shops, so is it off to an auto electrician? Caravan has gas/electric frig, gas stove. Has an exterior battery to run a couple of led lights. 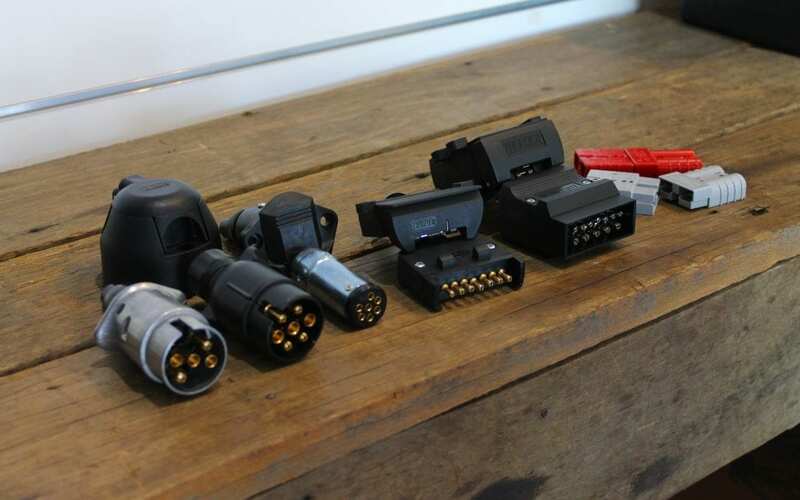 We always suggest getting a 12 Pin conversion done on your vehicle, it will be more secure than a connector and is a more universal solution if you ever need to tow anything else. We have a Britax 7 pin power plug on our caravan. After a 1 half hour trip we parked at the caravan park. The plug would not separate from the vehicle plug also 7 pin, by prying off the plug it was evident that one one of the wires had gotten very hot and blackened the number 2 pin, (reversing signal). This wire was thicker than the others & coloured pink. Can you tell us why this has occurred? We have an Anderson plug also installed. Thank you. If the Fridge feed is drawing through 7 pin it can draw up to 16 amps. We would recommend either fitting 12 pin plugs or use another Anderson plug to power the fridge in your caravan (preferably a different colour so you don’t get the two confused). Thanks Jack, glad you found the post helpful. Be sure to check out some of our other blog posts for more useful tips.